Each round film coated tablet contains Ranitidine Hydrochloride BP equivalent to Ranitidine 150 mg.
Neofast-S (Ranitidine) is a histamine H2 receptor antagonist. It inhibits basal and stimulated secretion of gastric acid. Neofast-S 150 is rapidly absorbed after oral administration. Food or antacid does not interfere with its absorption. Neofast-S 150 is indicated for the treatment of duodenal ulcer, benign gastric ulcer, post operative ulcer, reflux esophagitis, Zollinger-Ellison syndrome and in other conditions where reduction of gastric acid is required. Doudenal & Gastric ulcer: The usual dosage is one Neofast-S 150 tablet twice daily taken in the morning and in the evening or two Neofast-S 150 tablets (300 mg) as a single daily dose at night for 4-8 weeks. Reflux Esophagitis: One Neofast-S 150 tablet twice daily or two Neofast-S 150 tablets (300 mg) at bed time for 8 weeks. Zollinger-Ellison Syndrome: One Neofast-S 150 tablet 3 times daily and may be increased if necessary up to 6 g daily in divided doses. Dosage should be continued as long as clinically indicated. Episodic dyspepsia: One Neofast-S 150 tablet twice daily or two Neofast-S 150 tablets (300 mg) at bed time up to 6 weeks. Maintenance: One Neofast-S 150 tablet at night for preventing recurrence. 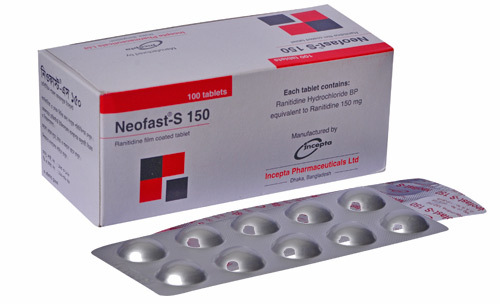 Neofast-S 150 tablet is well tolerated and side effects are usually uncommon. Altered bowel habit, dizziness, rash, tiredness, reversible confused states, headache, decreased blood counts, muscle and joint pain have rarely been reported. Ranitidine should be given in reduced dosage to patients with impaired renal and hepatic function. Ranitidine crosses the placenta. But there is no evidence of impaired fertility or harm to the fetus due to the Ranitidine. Like other drugs, Ranitidine tablet should only be used during pregnancy if considered essential. Ranitidine is excreted in human breast milk, Caution should be exercised when the drug is administered to a nursing mother.